Six years after the viral video game "Slender" hit the Internet, Slender Man fans have finally received the movie about the folklore villain that they have been waiting for. To the surprise of few, it was certainly not worth the wait. The movie is not only an underwhelming waste of time for those seeing it, but also a waste of the six years many people have been waiting for this movie to be made. Considering the amount of material and legends there are out there about Slender Man, one would think that the movie would've been better. Before we dive into the flaws of Slender Man, let's first discuss what it did well. Throughout a good portion of the movie, the lighting and cinematography was rather impressive, using shadows to help set the mood. 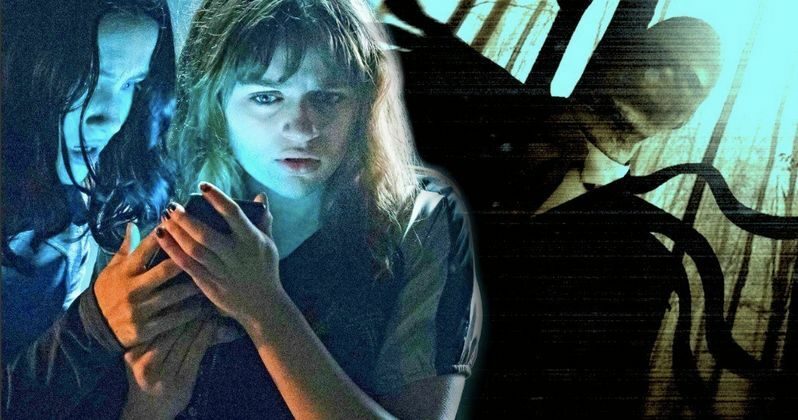 There were even some scenes where a tall, thin shadow loomed over the protagonists without them knowing, creating the eerie feeling that Slender Man is supposed to omit. Additionally, the beginning of the movie does an adequate job of setting up the fearsome struggle that is to come, preparing audiences for some truly horrific stuff. Despite the second half being a total disappointment, the set-up in the first half was decent nonetheless. Though the lighting of some parts of the movie was brilliant, in other parts it was incredibly lazy. The use of shadows became cheap and unfocused at times, as even in some of the more lighthearted moments of the movie, the lighting was set up so you couldn't see people's faces at all, completely ridding the audience of any emotional connection they could have with the characters during these times. Shadows are great on a person's face when the scene is intended to be ominous, but when the characters are casually talking and nothing is wrong, shadowy lighting is just pointless and looks bad. The movie was also riddled with quite a few chronological mistakes that made no sense, mostly between the continuity of night and day. For example, during one scene in the first half of the movie, we are supposed to believe the main character is in her house at night. Despite it being night, however, there's one window behind the hero for almost the entirety of the scene with full daylight coming out of it, despite no other windows in the scene having any light at all. At another point in the movie, two of the main characters leave right after school to visit their friend's house. However, once they get to their friend's house, it is inexplicably sunset, despite this part of the movie being set in June when the sun doesn't go down until around 9 o'clock. Either the two girls spent six hours walking to their friend's house, or the filmmakers just gave up on caring. Alas, the biggest issue that made Slender Man such an utter disappointment is their overuse of the "it was all a dream" trope. Horror movies often use dream sequences to scare audiences and tease them of what's to come. Unfortunately, Slender Man took this to a new level, making nearly every scary thing that happened during the bulk of the movie into a dream sequence or vision. The issue with this is that it didn't add any real stakes to the movie. It showed these fake frightening sequences one after another. While the first couple were enough to scare audience members and trick them into thinking it was real, after over a half hour of this, it just started to get old, making us wonder when something real would happen. By the time something real did happen by the end of the movie, it felt utterly pointless in comparison to the fake frightening scenes we had already seen. Unfortunately, this horror movie from Sony Pictures is one that I would recommend skipping, unless you truly love bad horror movies. Even if you do love bad horror movies, this might be one you'll want to wait for DVD for. Despite being less than an hour and a half, Slender Man still feels like a waste of time. If you genuinely love Slender Man and want to truly appreciate how scary he is, stick to playing the video game, as the movie will do nothing but disappoint.